Preheat oven to 300°. Combine two quinoa varieties. Heat a medium heavy skillet and dry roast the quinoa, stirring frequently, until rinse water evaporates. Place the quinoa, oats, coconut, flax meal, chopped nuts and seeds, and cinnamon in a medium mixing bowl and mix thoroughly. Combine the honey, maple syrup and oil, and pour over the quinoa mixture. Mix to evenly coat the dry ingredients. Spread the mixture on a parchment paper lined large cookie sheet. Bake for about 45 to 50 minutes, mixing every 10 minutes to evenly roast and prevent burning. Remove from the oven and add the dried cranberries and raisins to the granola mix. The granola is now ready to eat. To store, let cool to room temperature before placing in a tightly sealed glass jar or container in your cupboard or pantry. 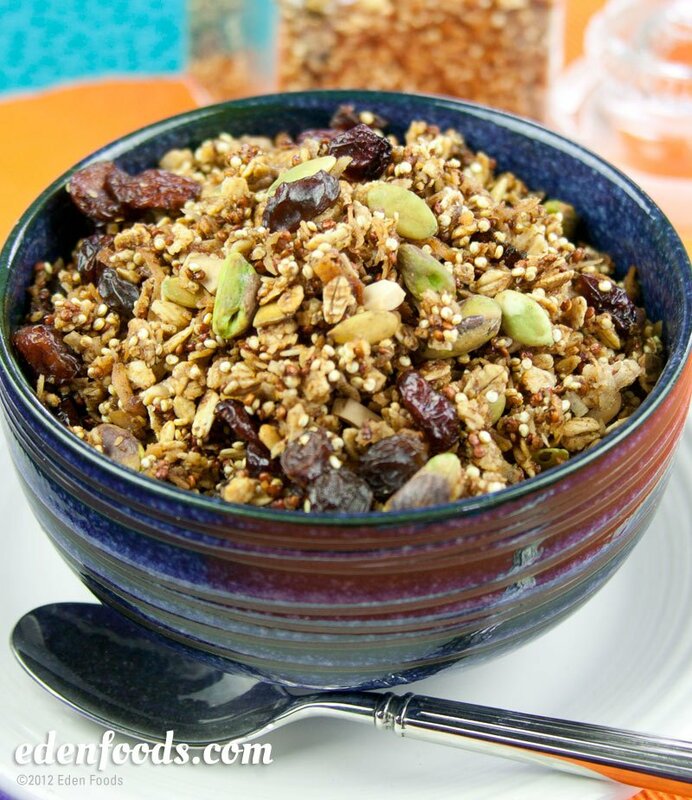 Granola is a delicious breakfast cereal with Edensoy or an any time healthy snack. Sprinkle it over any Eden Apples Sauce, smoothies or whatever you desire.